A distal radius fracture, or “broken wrist,” is a very common type of injury. These fractures frequently occur from a fall at home, a sports injury, or during a car accident. The radius and ulna bones are the skeletal foundation of the forearm. At the wrist, the radius is much larger than the ulna and supports about 80% of the force transmitted across the joint. The distal radius is the portion of the radius bone just below the wrist joint. What are the treatment options for a broken wrist? The treatment plan will depend on the severity of the fracture as noted on the x-rays and the patient’s medical condition, activity level, and desires. The distal radius bone heals back together after a fracture; the main question is whether it will heal in good alignment. In many cases, restoring the function of the hand, wrist and forearm is dependent on satisfactory healing of this injury. Most people have fractures which are well-aligned, and, therefore, do not require surgery. Treatment in these cases is typically rest and protection in a cast or brace for several weeks. 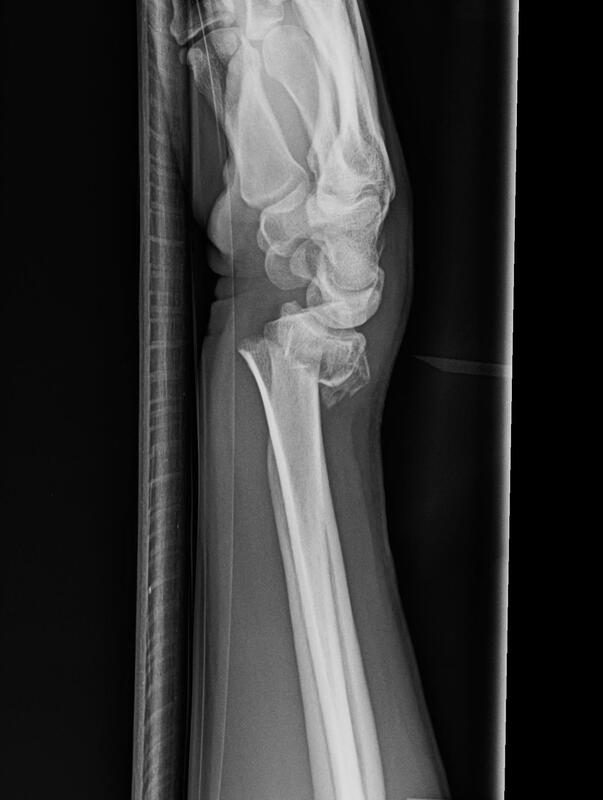 Follow-up x-rays are obtained in clinic to evaluate how the fracture is healing. Some fractures can be re-aligned well without surgery, called “closed reduction”, and those patients can also be treated successfully non-operatively. This is performed either in the office or emergency room using an injection of a local anesthetic (lidocaine). After the bones are “set” a plaster splint is molded to the wrist and forearm to maintain the alignment. Therapy is often helpful in improving wrist range of motion and strength after the fracture heals. It may take several months for strength and range of motion to fully improve. Sometimes people do not regain full range of motion or strength after a distal radius fracture. 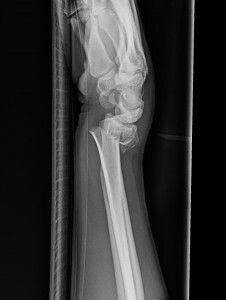 Some patients have fractures which are more severe and the alignment of the fracture is not satisfactory (“crooked wrist”). Depending on the patient’s health and activity level, surgery may be advised to correct the alignment. Surgery does not really “heal” the fracture; it simply allows the bones to be held in good alignment while the body bridges the fracture site with new bone. The bone healing takes a few weeks, usually about 6-8 weeks. What can patients do to improve their outcome? Adequate nutrition is important during the healing and recovery process. I recommend a diet rich in protein and calcium and an adequate intake of calories per day while your body is healing. If you smoke, eliminating tobacco products will decrease your risk of nonunion, delayed healing, and infection. Complying with the therapist’s recommendations is very important to maximize your result. I work closely with hand therapists at the Raleigh Hand Center in order to improve range of motion and strength. Interestingly, taking Vitamin C after a wrist fracture may reduce the chance of developing nerve complications and pain syndromes. I recommend taking 500 mg of Vitamin C daily for 2 months after the injury. What can patients expect after surgery? Rest and elevation of the hand above the level of the heart is very important for the first few days after surgery to reduce swelling. I encourage finger range of motion to help prevent digit stiffness. Shoulder and elbow range of motion exercises are also important to help prevent stiffness in these joints. The first few days after surgery can be painful, and narcotic medications will be prescribed to help. These meds should be weaned as the pain improves. Your wrist will be protected in a plaster splint which will be removed in clinic along with the skin sutures at about 10-14 days. At this point, most patients can begin therapy and use their hand lightly. 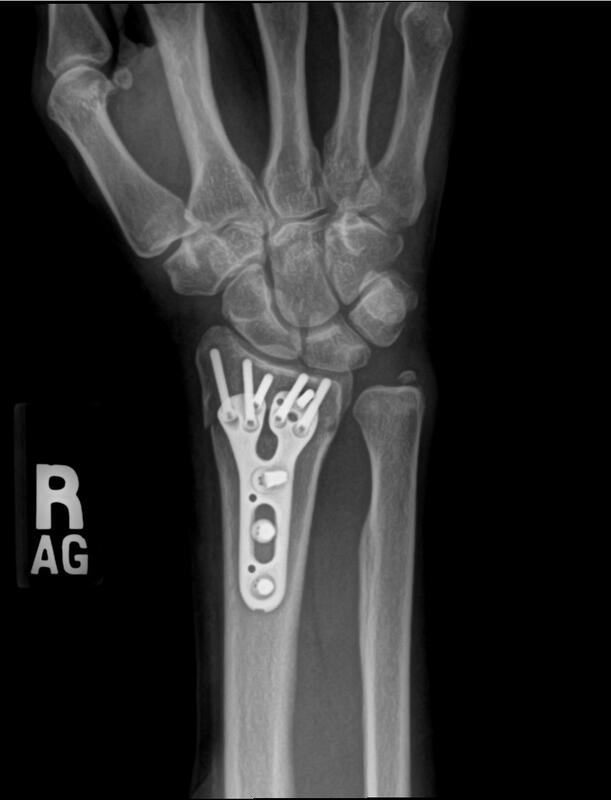 I recommend avoiding heavy use of the hand until the fracture is healed, approximately 6-8 weeks after surgery. Pain, swelling, and stiffness gradually improve over time. Most patients can return to more normal function at about 2-3 months post-operatively, but maximum improvement can take 6-12 months. Recovery time varies among patients, depending on the severity of the injury, possible complications, and pain tolerance of the patient. Occasionally, patients have residual stiffness and “aching” in the wrist after treatment. Arthritis, also known as degenerative joint disease, may develop in the future if the initial injury damaged the joint surface. My goal is to help each patient obtain the most function possible after the injury. I broke my wrist. Do I need surgery? No surgery is risk-free. 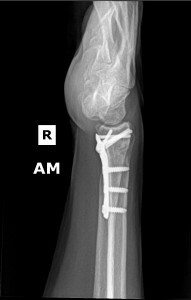 However, the risk of major complications from distal radius fixation is low. Possible complications include pain, bleeding, infection, swelling, stiffness, tendon irritation, hardware failure, and damage to the surrounding nerves and blood vessels. 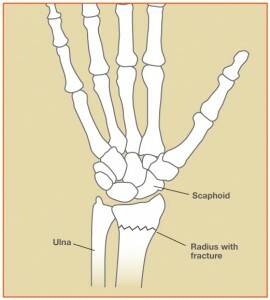 A fracture which fails to unite is known as a nonunion. A fracture which heals with deformity is known as a mal-union. Other complications are also possible but are uncommon. How can patients prevent another fracture? 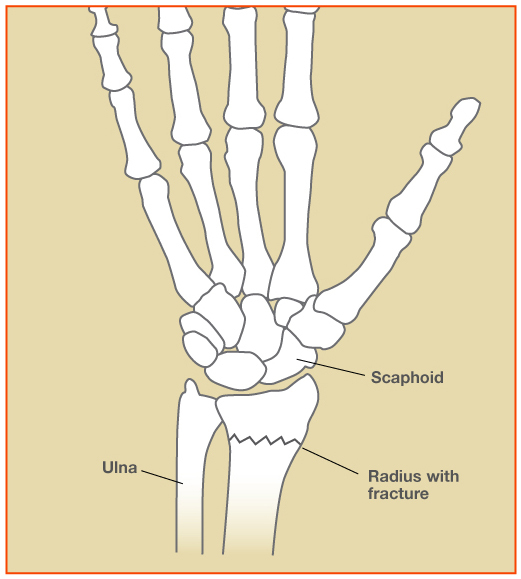 Some distal radius fractures are related to reduced bone density or osteoporosis. Most people with osteoporosis can decrease their fracture risk with lifestyle changes and medication. Talk to your primary care physician about the need for a bone density study at your next appointment. Please call 919-872-3171 or visit www.raleighhand.com website. Dr. Erickson is a hand and upper extremity specialist and treats patients with hand and wrist injuries from the NC Triangle area including Raleigh, Durham, and Chapel Hill, NC. For patients with a long drive, treatment can often be coordinated with a provider closer to home after a few visits to Raleigh.